We are architects, and during the last few years we have been reading and commenting on several architectural websites. As many of you do, we love to watch, learn and discuss about architecture online. We are architects, and during the last few years we have been reading and commenting on several architectural websites. As many of you do, we love to watch, learn and discuss about architecture online, with people from around the world. One day we decided to put all these sites together to get the whole picture on architectural sites, and then order them according to our likings. But in the meanwhile, we noticed it wasn’t that easy, because each one of us had different interests and approaches. In our listings, several sites were repeated, but in different places. So, we decided to find a way to make a standardized procedure to rank and order these sites. 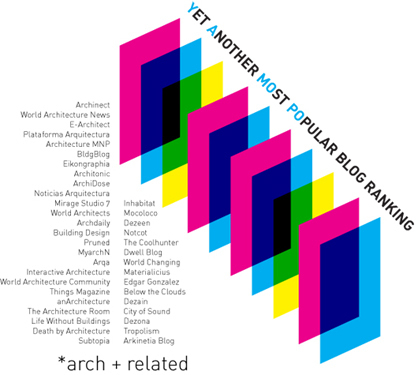 Then we noticed Michiel van Raaij at Eikonographia repeated the ranking he started in 2007, the MoPo (Most Popular Architectural Blogs). Although Michiel did a very accurate job, he restricted it to English blogs from individual authors, leaving out several of our favorite blogs from either foreign languages or multiple authors, and some other sitess that mix architecture with other related subjects (design, sustainability, trends, etc). To expand this rank, we decided to put together some common criteria. The most logical criteria should be the amount of visitors, but this is almost impossible since most sites don’t publish these stats. But there are some other factors you can use to measure the relevance of a website: (a) Rank of websites based on an estimate of their traffic, by Alexa, (b) Google Page Rank and (c) and the frequency of the updates, an average of the entries published in the last 2 months (done by us). That´s how we came up with YAMoPo (Yet Another MoPo). With all this data, we started to compare our sites listings, and given their focus we decided to (1) shorten the list to the top 40 (after those, most sites don´t update much often) and (2) separate this listing in 2 types of sites: sites devoted to architecture only and sites that mix architecture with other subjects (trends, design, sustainability). It´s clear that architecture exclusive sites are less popular than the ones that cover architecture, trends and design. Most of the websites are in English (same as almost the whole Internet). The frequency of updates is highly valued by visitors, which explain us why our blog isn´t at the end of the ranks despite being started a couple of months ago. Sites that have a better rank update frequently, even several times at a day. During the next weeks we will present and explain some of these websites, in order to clarify the new panorama of architecture publications on the Web. Also, as we found out that MoPo wasn´t accurate from our point of view, some of you might think the same about ours, so feel free to leave your comments and recommended sites.